What’s In The May 2011 Issue! 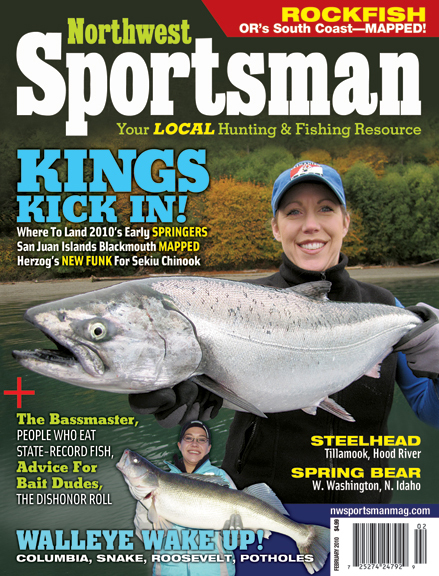 Sept. Northwest Sportsman Coming Out, Plus 2 New Mags! AW: God, could you grant me an extension on autumn – like maybe make it two or three months longer? God: Time stops for no man. AW: How about an extension on this Editor’s Note? God: That’s actually up to your press foreman – who just emailed, by the way. SEPTEMBER 2010 NORTHWEST SPORTSMAN. THAT'S ERIC BRAATEN UP TOP WITH A MUZZLELOADER MULEY, SENT IN FOR OUR HI-VIZ PHOTO CONTEST, AND DOWN LOW IS HEATHER LUSK WITH A BIG COWLITZ CHINOOK FROM 2009, CAUGHT WITH SWANNY'S GUIDED FISHING. AW: How about cloning me? What do you think about that? Maybe like make one me who can go deer hunting up to Okanogan County, another to hit the middle Rogue for steelies, another to stay home and help Mama with the boys, another to finish up work on the shed – actually, two or three more AWs for that last one, I’m not so good with hammers and power equipment. I could get so much done! AW: Look, it’s not my fault. You did a fantastic job on fall – your absolute best work, bub – but there’s blessedly little of it to go around! God: Ever hear of living vicariously? AW: … Err, sorry to interupt, sir, but the press guy’s really anxious to get this thing rolling. God: And I’m anxious to get fall going too. 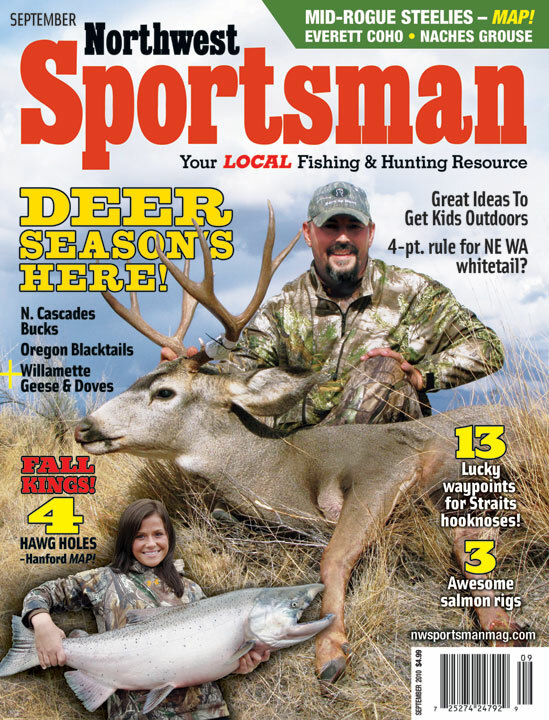 NEW MAGAZINES This month, Northwest Sportsman is also launching two new titles. We recognize that a fair number of you are traveling sportsmen, which is why we’re launching Alaska Sporting Journal, a quarterly magazine dedicated to getting you, the Seattle/Portland/Spokane/Eugene angler and hunter, to the Last Frontier. 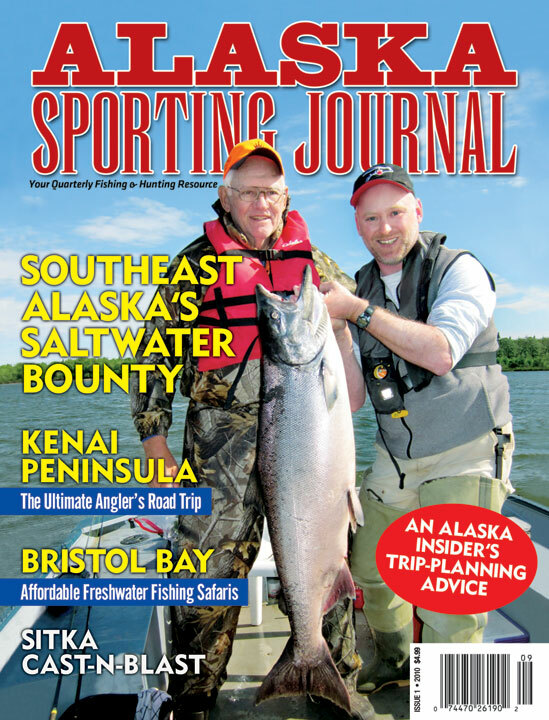 THE PREMIER ISSUE OF ALASKA SPORTING JOURNAL! Written by Alaska insiders, we prep you for the trip of a lifetime to such destinations as Sitka, the Kenai Peninsula, Bristol Bay, and more! 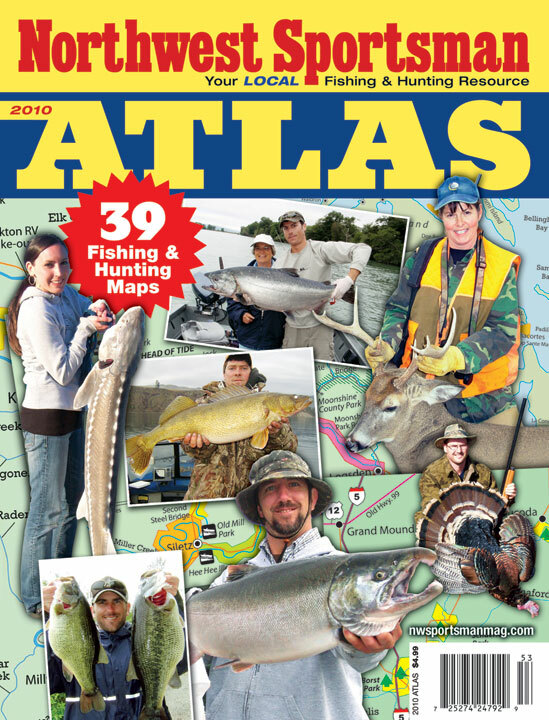 THE FIRST ISSUE OF NORTHWEST SPORTSMAN ATLAS. “‘It’s On! 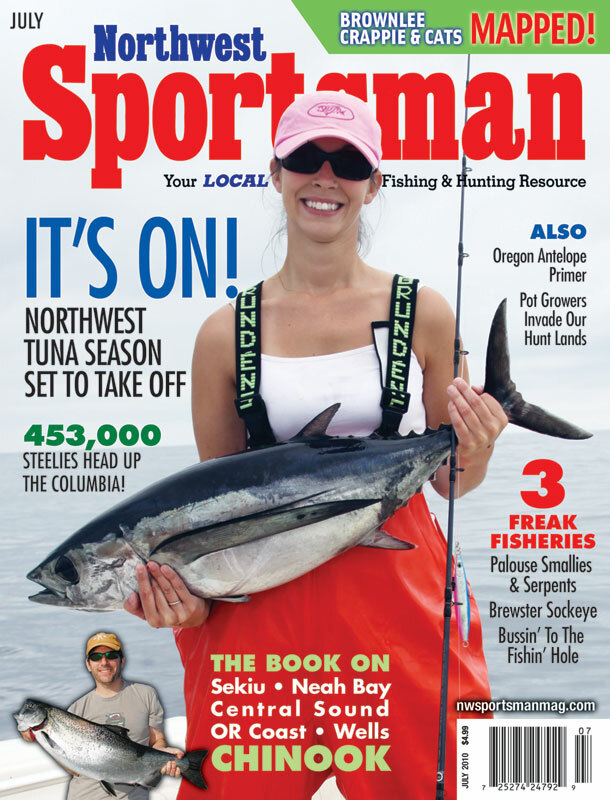 '” reads the cover of the tuna-tackling July issue of Northwest Sportsman just as reports of the first sport-caught albies of the year crop up! According to reports on ifish and Northwest Wild Country, tuna were caught the weekend of June 25-26 well over the horizon from Newport, sending more than a few salty dogs into delirium — “How far (is) the 126 (line) from Provo? ?” writes Reel Obsession– and ushering in what could be a fantastic season. While other regional and national magazines completely ignore this booming fishery, Northwest Sportsman has you covered with advice from our very own tuna hound, Andy Schneider. He interviews Tron Bull of Secret Island Fishing (907-738-4500) who was in on last weekend’s fishing. The duo detail how to get in on the early-season bite, while Rob Tobeck of The Outdoor Line in Seattle speaks with another salty dog, Capt. John Keizer, for more tips. But just in case all this albacore is Albanian to you, our Saltwater columnist Larry Ellis has an A to Z guide about what the hell everything from Albacoritis to cedar plugs to feathers to Mexican flags to pinheads to SSTs to zucchinis. Elsewhere on the briny blue, our July issue covers the Chinook scene at Sekiu, Neah Bay and Central Puget Sound while Mark Veary launches his tupperware boat into the surf of Oregon’s Central Coast to tackle salmon just off the breakers. If you’re more content to stick to fresher waters, fantastic, have we got a couple of GREAT runs for you to target!! With six of the seven largest daily counts of sockeye ever recorded at Bonneville Dam over the past week and a half, Leroy Ledeboer details how to waylay those BC-bound buggers up in the Brewster Pool. And with another big return of summer steelhead forecast to the Columbia, Terry Otto’s got the scoop on where to fish in the immediate Portland-Vancouver area as well as up- and downstream from there. Buzz Ramsey, the legendary Northwest anglers, has tips on how to go about catching these fish sans snag-ups. Local boy Jason Brooks reveals how to whack and stack summer Chinook below Wells Dam on the upper Columbia while Ellis went on one hell of a long road trip to map Brownlee Reservoir’s outstanding summer crappie and catfish bites. Duane Dungannon, president of the Oregon Hunters Association, previews antelope season while Wil Askew discusses how Beaver State kids can score “first-time” tags. Dave Workman, who’s gone on one or two hunting trips, talks about why you must bring along an extra rifle scope this season while new trout fishing columnist “Uncle Wes” Malmberg walks us through how to make a pretty mean worm troll. And as if all that isn’t enough, we’ve also got articles on how marijuana growers are invading Northwest hunting grounds, the Dishonor Roll, bussin’ it to the fishin’ hole, how new technology is allowing salmon managers to map Chinook stocks at sea and the most outlandish fishing hat you’ll ever see. Period. “Gross,” said my wife when she saw the photo. All inside our huge July issue. It’s on its way to homes and newsstands now! Streams and beaver ponds are also now ‘closed unless open,’ a 180-degree reversal designed to protect ESA-listed salmonids. GOLD BAR, Wash.—The fish were never large – except on one notable occasion – but now we may never get to fish the middle Wallace in summer for them again. It was one of many streams as well as beaver ponds that were summarily closed or were slapped with more restrictive rules this year, part of sweeping changes affecting Western Washington waters everywhere from Neah Bay to Mt. Rainier to the Canadian border as managers try to protect weak salmonid stocks. So much for the age-old delights of wandering down any ol’ crick or clambering out on a beaver dam on a hot summer day and flipping spinners, flies, salmon eggs or worms for whatever’s biting. True, the affect probably won’t be felt by a large percentage of Pugetropolis’s angling public, but it will be a loss for the guys who might have a stream in their backyard they like to fish, or adventurous kids who beat the brush to access hidden waters. “It makes me cry to see that the stream I grew up fishing for cutts will be closed,” notes one North Sound angler. A FRIEND WHO WORKED at the state park on the Wallace found out about the fishing. When the sun burned down on July days, he, another pal and I would dive off the trail up to Wallace Falls, wade through the ferns down to where the forks of the river met and work our way up- and downstream. There was little room for backcasting as we hopped from rock to rock, but the fish didn’t seem to care. They eagerly bit Hare’s Ears and Prince Nymphs. And we didn’t care that the fish were small. It was really more about getting afield with friends, staying cool and being somewhere that few others went. The best spot was a pool below where the river slashed down a diagonal 66-foot “flume.” At the bottom the Wallace bit into a rock wall that not 150 feet above us supported hordes of hikers tramping past completely unaware of the hidden glen. From the shadows underneath the overhang, 10- to 12-inchers would zip out and grab whatever floated past. Once, however, we caught glimpses of a far larger fish, something around 10 to 12 pounds. Of course it didn’t bite. What that megafish in the small pool was I couldn’t say. But it probably had something to do with why fishing the middle Wallace in summer is no longer an option. TO BE CLEAR, the Wallace – like almost all Puget Sound streams – is no Deschutes, Yellowstone or other über-trouty river. Wild winter-runs, summer Chinook and bull trout use it for spawning and rearing habitat, and juveniles of the species – as well as resident rainbows and coastal cutts – were most likely the fish we caught. The first three are now listed as threatened under the Endangered Species Act. “Frankly, some of our populations are not healthy and we need to take extra measures to return them to healthy levels,” explains Craig Burley, the state Department of Fish & Wildlife’s Fish Division manager. Before, all unlisted streams and beaver ponds in those two regions were open June 1-Oct. 31 under blanket statewide rules – daily limit two, minimum size 8 inches, baits such as eggs and worms OK. But now it’s the reverse: If your fave ain’t in those dozen and a half pages, fishing’s a no-go. And many of those that still are open now fall under selective-gear rules, meaning single, barbless-hooked flies and lures only, and no smelly gunk. The idea is to protect young steelhead, salmon and bull trout in waters where they’re “at risk of being incidentally caught and may not survive being handled and released, especially if bait is used,” WDFW says. Burley couldn’t quantify how many streams and ponds were closed as a result – a minimum of 175 creeks, 71 rivers, a slough, a ditch, and beaver ponds in Mason and Kitsap Counties and Big Beaver Creek Valley do remain open – but he feels that anglers will appreciate being able to open the rules book and clearly read whether their stream is fishable or not. KNOWN AS WDFW’s “stream strategy,” the changes came out of last fall and winter’s rules-making process. Some anglers had wanted to be even more restrictive — no bait, barbless hooks, or close all rivers with anadromous runs — while others thought more review was needed or that only streams with low runs should be affected. At its February 4-6 meeting, the Fish & Wildlife Commission approved the strategy with some tweaks. 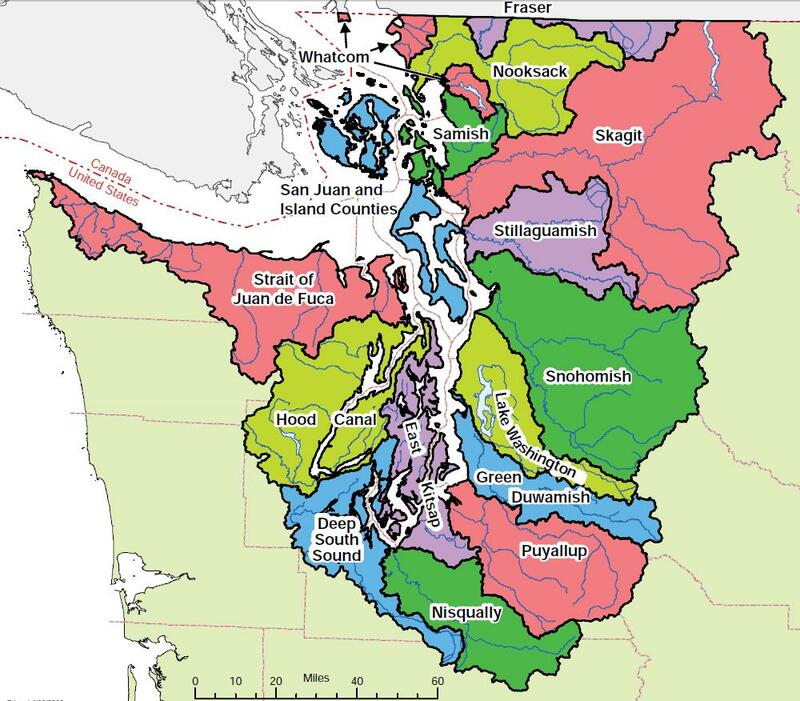 It’s all part of larger modifications to regional fisheries in the wake of those ESA listings, the latest of which came in May 2007 and protected Puget Sound and Straits steelhead. As I reported in April, the commission last winter OKed shortening winter steelheading by two weeks on many rivers. WDFW has quit using late-arriving hatchery fish to meet egg-take goals and no longer stocks smolts in streams where they can’t collect returning adults. The idea is to separate hatchery and wild runs as much as possible to prevent crossbreeding. Burley says the agency is struggling to protect fish and meet conservation goals while at the same time trying to provide quality recreational opportunities. IT’S ONE MORE GRIM reminder that the good old days are long gone. Ages ago, Bob Heirman wrote Snohomish, My Beloved County: An Angler’s Anthology about the glory days of fishing the waters east of Everett. Reread it today and you’ll realize the world we’ve lost. EDITOR’S NOTE: THIS IS AN EXPANDED VERSION OF A STORY THAT APPEARED ONLINE IN LATE APRIL. A friend of mine was having some troubles springer fishing on the Columbia system during only the best fishing of the decade – issues with his crews, tackle, sea lions, weather – so he said the hell with it. But Chris didn’t quit fishing, just hung up his salmon gear and dug out his bass stuff. Pretty soon I started getting excited phone calls and emails. Chris, whom I’ve known since Wazzu 18 years ago, has a love-hate relationship with fishing. I kid you not: I have literally seen him down on his knees repeatedly stabbing a bird’s-nested baitcaster. Whenever he goes fishing, some sort of hilarity ensues, often at his own expense. It would make a pretty entertaining book. But I admire his dedication to a sport that gives him such fits. Last September, his grand plan to find Lower Columbia walleye blew up when that massive run of coho wouldn’t leave his plugs alone. He trolled with it, though, and enjoyed a couple weeks of pretty good fishing and fresh grilled salmon dinners. In an increasingly polarized world, one where even we fishermen seem to be falling into ever-narrowing niches of salmonid anglers only, bassers only, fly guys only, salty dogs only, it’s refreshing there are generalists like Chris still out there, guys who don’t give up on the sport just because their fish doesn’t want to play ball or some new reg gets in the way of what they’ve always done. This issue’s for you, muchacho. When your bass quit biting, I’ve got a jetty trip lined up for you (pages 28-30). When the rockfish and lings are done feeding, try poke poling for wolf eels (pages 102, 103). Then I’ve got a mess of trout and kokanee lakes for you to try (pages 42, 44, 48, 52, 54,56, 58 and 60). When those poop out, Chinook and steelhead are back up to bat, bub (pages 32, 34, 36, 74, 78, 86, 90 and 92). And when you’ve had your fill of those guys, it’s spinyrays – walleye and panfish – again (pages 62, 68, 70 and 94). Yeah, that’s a lot to do, and yeah, once again Northwest Sportsman stomps the balls off of our ya’ll-hollerin’ 60-paged competitors from Down South. 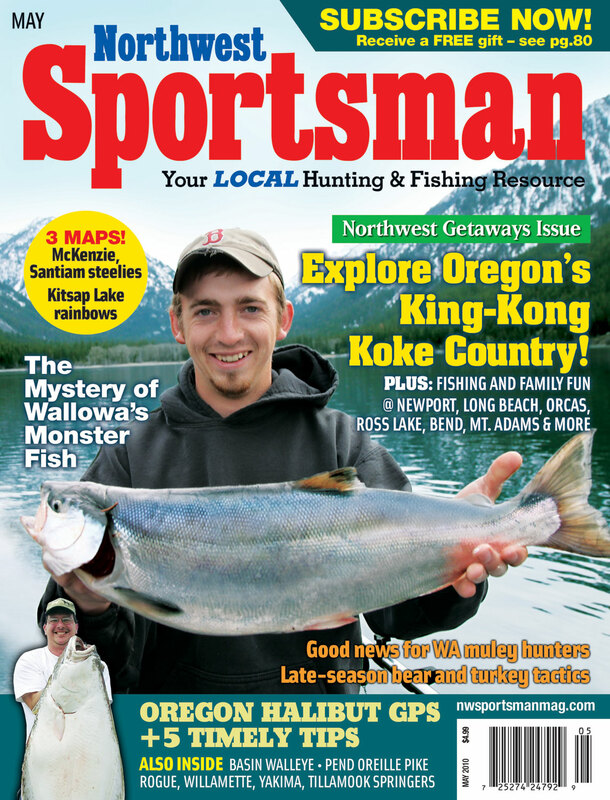 JUNE 2010 NORTHWEST SPORTSMAN, COVER IMAGE BY TONY FLOOR. I must confess that two summers ago, I camped right beside a trout-filled lake and didn’t fish it once. Didn’t fling a single fly, toss a spinner or plunk dough from our little beach at Pearrygin Lake, or off the dock down the way. Nope, I spent the entire trip trying to keep a 1-year-old boy under control. It actually took three of us, two adults and our preteen niece, but even so, there was no time to break away. 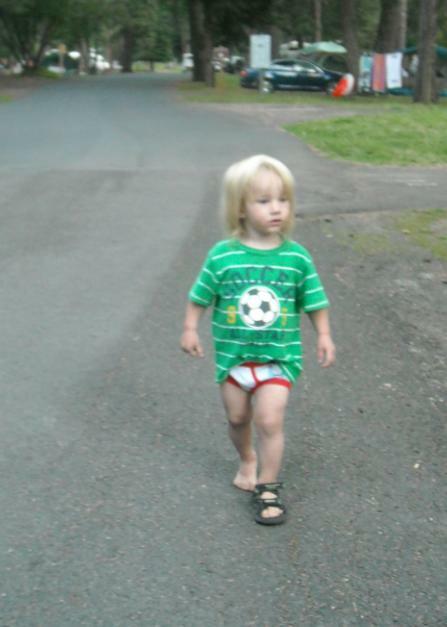 It was a sobering entry to fatherhood for this formerly footloose fisherman. Never before had I gone camping without wetting a line. Sideswiped by a whirling dervish of a dirt-and-charcoal-covered toddler. It was also a bit embarrassing for a sporting magazine editor. So much so that for our next family camping trip – last Fourth of July on Orcas Island in the San Juans – we called in reinforcements, four more adult hands. It worked. I was able to troll and bank fish around the shores of a pair of lakes at the big state park there. That gave Amy and I some confidence. The next month just we three camped at Wallowa Lake State Park under Oregon’s Alps and I spent half a day on the water with a local kokanee guru. OF COURSE THIS PAST WINTER we added another boy to the lineup, so my new one-year camp-fishing streak may be in jeopardy. But a funny thing happened on those two campouts last summer: I enjoyed the fishing as much as I did playing tourist – wandering around towns, licking ice cream cones, snapping pictures of murals and funny signs and going on hikes and scenic drives with the fam. 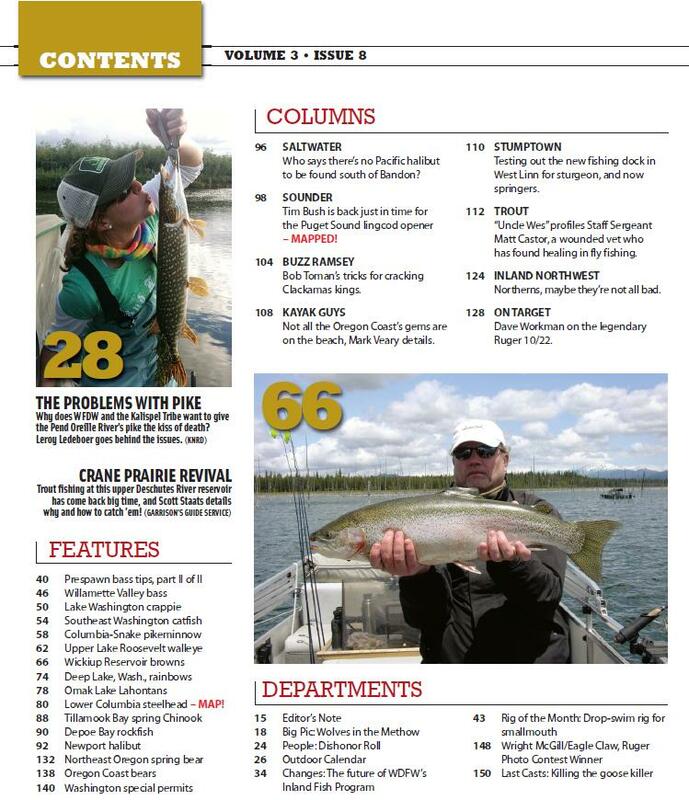 I wrote about our trip to Wallowa last year, and with all those King Kong-sized kokanee they’re catching up there, expanded upon it with fishing tips, sights to see and family fun to be had in our May issue. Indeed, this issue’s for all you anglin’ Daddies who’ve found yourselves in a similar predicament: needing a Northwest Getaway that works for the fam and, if the moment should arise, has fishing handy. For our special section, I asked writers across the Northwest for their ideas. They sent me great pieces on Washington’s Long Beach Peninsula and Oregon’s Newport, Astoria and Florence areas; Ross Lake, Mt. Adams, Bend and the upper Rogue in the Cascades; clamming and oystering in Puget Sound and Hood Canal; and more! WE ALSO PREVIEW spring pike and walleye fishing in Eastern Washington and the Idaho Panhandle and follow spring Chinook up the Rogue, Willamette and Yakima Rivers as well as into Tillamook Bay. 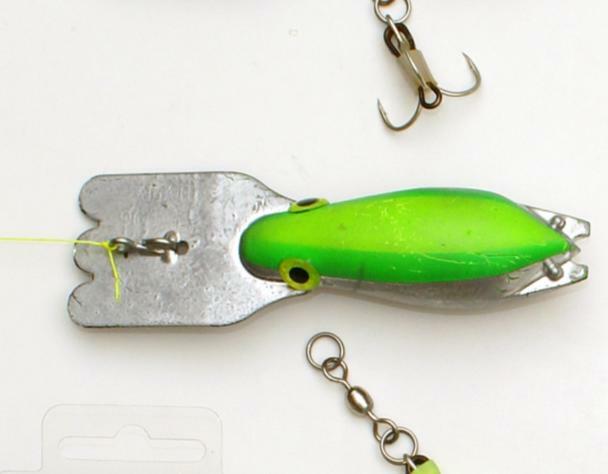 Speaking of springers, a Southwest Oregon guide got to wondering about the tooth marks on his diver, so he began tinkering with how to turn the device into a bait itself. This issue he reveals two years’ worth of research to Larry Ellis with a Rig of the Month you don’t want to miss. We also head offshore for halibut with Andy Schneider in search of The Chicken Ranch and Banana Bank, armed with a mess of timely tips from a guide out of Garibaldi. 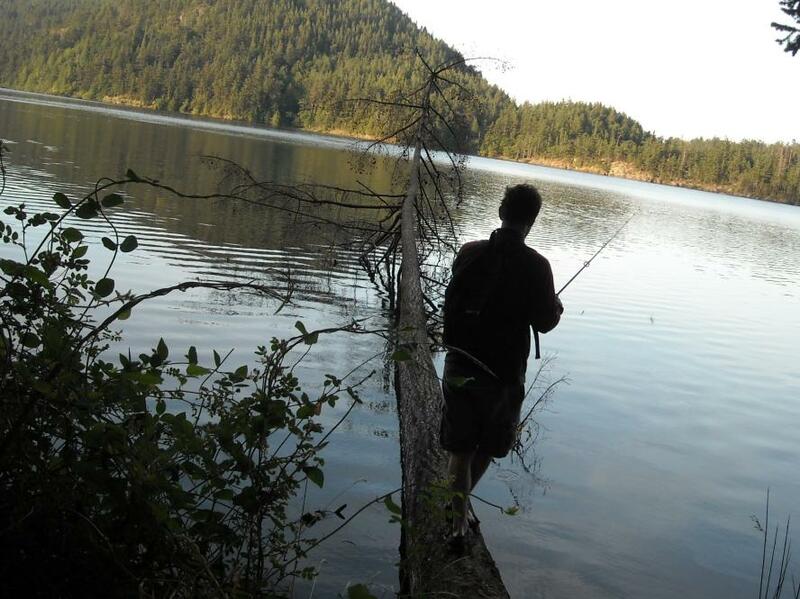 And there’s also trout fishing to be had at Kitsap Lake right outside Bremerton and Lost Creek Reservoir, outside Medford. Our columnists again cover a wide range of topics — Terry Otto on the fall of a controversial though popular bank-fishing spot on the Willamette; Buzz Ramsey on tipping, err, tipping lures, not cows and waitresses; Mark Veary on 3 great tactics for kayak angling; and Ellis lines up Chinook seasons on the coasts. On the hunting front, Dave Workman details the three best cartridges for varmints, Wil Askew chases down late-season turkey and bears while Duane Dungannon reveals Oregon’s new dog-days cat hunt. New columnist Ralph Bartholdt talks about the dangerous new places wolves are pushing Northern Rockies elk, and there’s good news for Washington mule deer and whitetail hunters. All that plus sturgeon poachers, the Jackass of the Month, Mt. St. Helens, dam removal, ODFW’s Greenback Hatch, the Waterdog Shack and more in our biggest issue yet — the 160-page May issue, out to newsstands and subscribers in April’s last week. Here Comes Trout Season — And Our April Issue Delivers Limits! There wasn’t much distinctive about the old pond. It was only a few acres and just as rectangular as our farm. There were berms and culverts at either end, trees had fallen in on two sides, and it was maybe 7 feet deep tops. But the pond held trout, beautiful things, fat too. Galloping through mud puddles when the action was slow. LOOKING BACK, I realize how lucky I was to spend half my preteen life with that pond so close by. And I sometimes wonder if I would have ended up in this field – writing and editing hook-and-bullet stuff – if my folks had not decided to move out there when I was just five. With two boys of my own now I feel a tug to get the hell out of the big city and set up somewhere similar. If the boss would let me telecommute, I know where I’d move: Mason County. 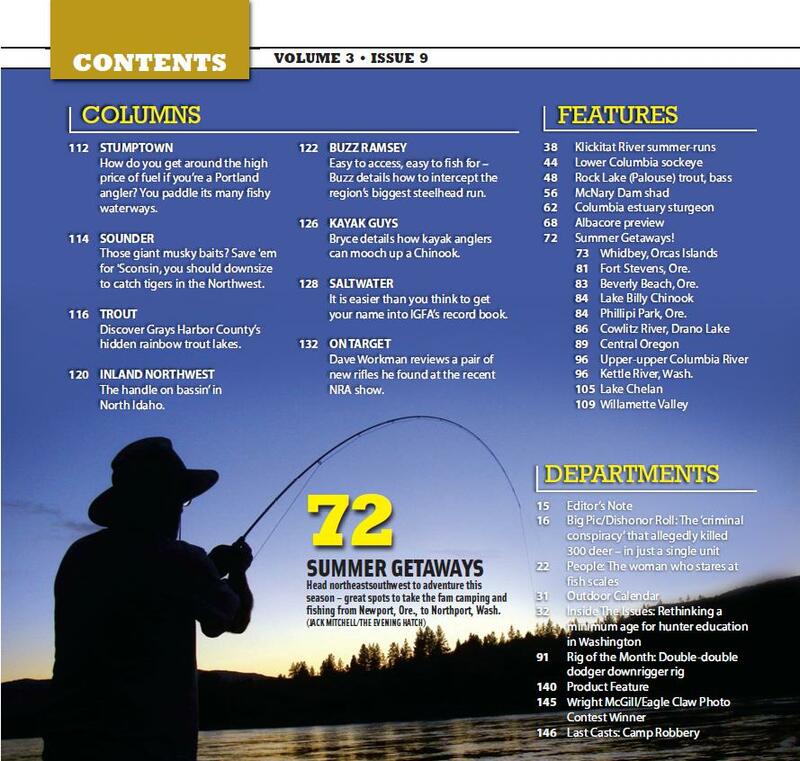 Or would it be Bend, with quick access to the trout-, char- and kokanee-rich waters of Oregon’s Cascades, which Larry Ellis details in this issue? Then again, there’s the Okanogan and its myriad of trout lakes primed for the opener, as Leroy Ledeboer advises. Argh, that’s the great thing about the Northwest. We’ve got more lakes than anywhere else west of Minnesota, and most will be jumping with trout this month, to the delight of youngsters and their canoe-packing dads everywhere. OUR APRIL ISSUE ALSO SERVES UP whiskerfish! We check in on the spring bites on the John Day and Palouse Rivers, as well as Brownlee Reservoir and Henry Hagg Lake. 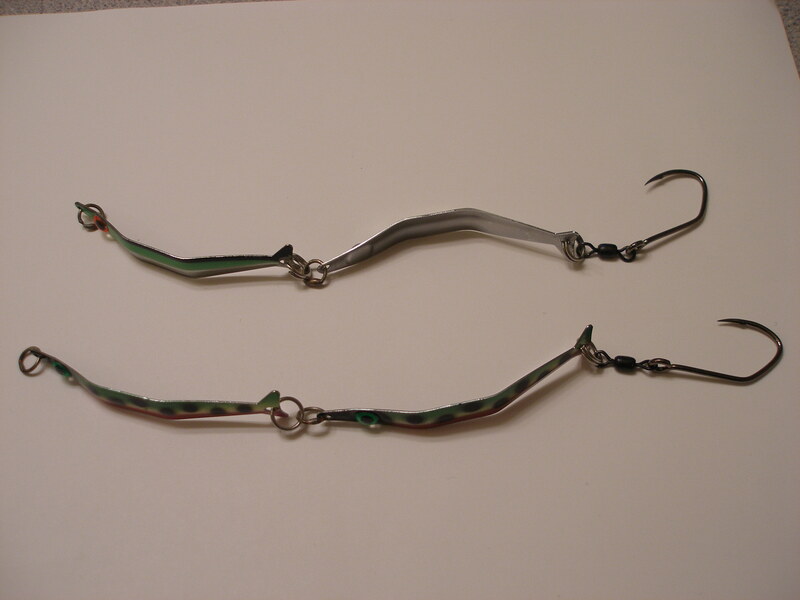 And if you’re a catfish newbie, Larry Ellis has a fantastic setup in our Rig Of The Month! As springer fishing picks up steam on the Lower Columbia, we get in front of the run with stops at Wind River, Drano Lake, Deschutes River, Tri-Cities and The Wall at Little Goose Dam. Since it is spring, we also head out on the Turkey Trail, with stops in Medford, Eugene, Colville, Okanogan, Dayton, Lyle and The Dalles! In a nutshell, gobbler prospects look good around the region, even the hard-hit northeast corner of Washington. And spring isn’t spring without spring bear hunts. We finish up our four-month-long series with a look at Southwest Oregon!! We also delve into the mystery of Jameson Lake’s “algae” blooms, how Oregon highway engineers are preventing roadkill near Bend, the state of North Puget Sound steelheading circa 2010, two pages worth of game poachers, scofflaws, boneheads and jackasses, Portland’s Kings For The Kids springer tournament and why Gov. Gregoire may owe you some dough. And we celebrate that Northwest holiday known as opening day of trout season with a peak back to 1962! 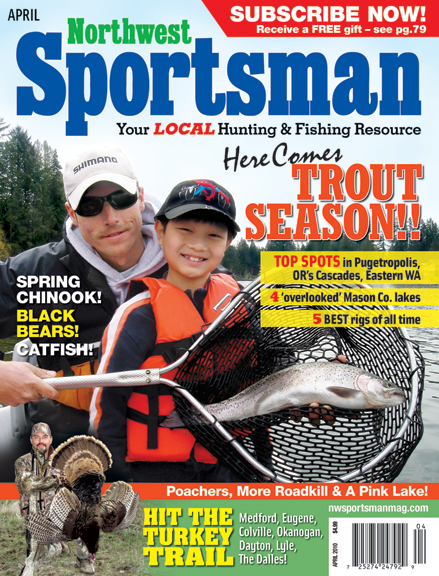 All that and more in the April issue of Northwest Sportsman, on shelves and mailboxes later this week! My heart was set on lots of wild winter steelhead coverage in our big February issue, but with many runs not faring so well, we ease the pressure and go after keepers of other species instead. Indeed, with woes hitting his favorite species hard, Bill Herzog found good action on immature Chinook, or blackmouth, in the Straits of Juan de Fuca last year. In this issue, he tells Tim Bush about the “new funk” for that fishery, which reopens at mid-month. The myriad passes and banks in the nearby San Juans also come into prime shape, and author Wayne Heinz has collected 101 years of blackmouth wisdom from six salty dogs — five charter skippers and the venerable Tom Nelson of SalmonUniversity — for his map feature on the sunniest salmon fishery in Western Washington. Speaking of maps, Larry Ellis highlights South Oregon Coast rockfish, lings and Dungeness – crabbing’s so good he’s been throwing back legals! Hey, Larry, ship those extras my way, buddy! 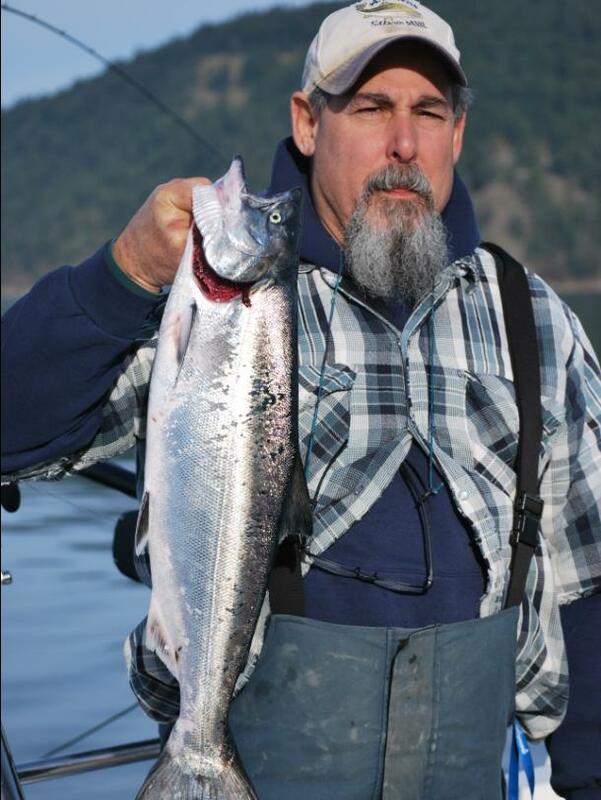 Then there’s Tillamook and Hood River steelhead; on the former, fishing can actually be at its best in late winter. 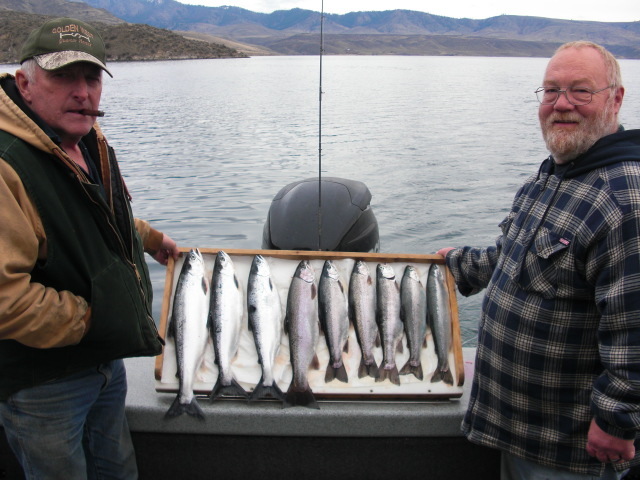 Way up in North-central Washington, it used to be that this time of year at Lake Roosevelt was all about walleye, but the trout action’s been the “best in a decade” and the kokanee fishing’s pretty good too. As we ease deeper into winter, those fish ease deeper downreservoir, and we track ’em down for you. “Uncle Wes” Malmberg has some advice for bait trollers — hint, yer dragging yer junk TOO HIGH! — and Bryce Molenkamp details how to catch Potholes Reservoir walleye from a kayak. Speaking of walleye, new pen Dennis Dauble, a Tri-Cities author, columnist and retired federal biologist, hits up his good friends for where to find Ms. Piggy in the Hanford Reach and lower Snake River this time of year. Speaking of Ms. Piggy — no offense, of course, we don’t need any karate chops to the throat — Larry Ellis and I detail five potential state record fish in Oregon and Washington that have been A) breaded and eaten several hours later instead of weighed and certified, B) barbecued and eaten by the neighbors instead of weighed and certified, C) filleted, smoked and eaten instead of .. well, you get it, and D) misweighed and released. One guy who we’re pretty sure will be able to land AND hold onto any fish he catches is Bassmaster Classic-bound Don Hogue, “the first Washingtonian to compete in the ‘Super Bowl of Bass Fishing’ since 2006, and one of only a handful of Pacific Northwest representatives in the 39-year history of the event,” writes Joel Shangle of Northwest Wild Country in his profile of the Pasco High School teacher and member of one of the region’s older bassin’ families. On the hunting front, in part 2 of our series on spring bear hunts, it took Brett Carlile a long time to bag his bruin last year near Monroe, Wash., but in doing so he learned some valuable lessons. Ralph Bartholdt previews the upcoming black bear hunt in North Idaho and columnist Wil Askew writes about the Willamette 615 tag, a deer hunt that runs clear into February. And in the wake of the Skagit fiasco, would you believe that just to the east of Seattle another hunt to remove excess wapiti has been going on since late last summer? In a valley that’s even more populated. Next to a state highway and an interstate. In the vicinity of an outlet mall, a massive housing development and the state’s second most-visited tourist attraction. Oh, the reason you haven’t heard about it in the news? Like almost all of the rest of 2009-10’s general-season and damage-control hunts, there’s hardly anything to report – at least anything bad. As of Jan. 12, with at least 16 elk culled, things have gone off without a hitch. Jason Brooks details Washington and Oregon’s Master Hunter programs and I further the disgracing of poachers with the Dishonor Roll. All that and much, much more, out now in our 144-page-big February issue! Big New January Issue Out! It’s the coldest month of the year, but our big January issue comes out with guns blazing and lines arcing. While we drill through the ice for rainbows and crappie, and head afield for last-quack waterfowl blasts, we cast an eye towards spring with part I in our four-part series on bear hunting. The 140-page issue also contains an excerpt from Don Thomas’s new How Sportsmen Saved The World, how an elk hunter saved a herd of starving, abandoned horses and the latest roundup of game scofflaws and poachers whose names shall be mud. For steelheaders, we map out the Sol Duc, where the rewards can be worth the risk of a treacherous river, and the Nestucca, which, reports Andy Schneider, can be a plugger’s or side-drifter’s paradise. And John Patton, a punchcard-filling Olympia angler, details the 15 “little things” that keep him in fillets year-round. While the Northwest will never be known for ice fishing, we do have our share of grumpy old men who enjoy the sport on a wide range of lakes from Okanogan County to Spokane to Prineville to Lakeview, as Terry Otto, Jason Brooks and Leroy Ledeboer reveal. If you’d rather fish in warmer environs, Larry Ellis’s “How the ocean made a better rainbow trout fishery” details well-stocked Garrison Lake, right next to the Pacific. He also concludes part 2 in his series on that strange world known as bobcat hunting. Tim Bush and Buzz Ramsey’s columns cover steelheading while Otto’s Stumptown examines panfishing around Portland. Mark Veary of Hillsboro reveals the amazing variety of Northwest species that can be caught from a kayak while Fly Guy Chester Allen hits the beach for Puget Sound’s best winter trout fishery. Wil Askew fesses up to being a former Willamette Valley goose hunting virgin and Dave Workman has advice for keeping yer shooting eye sharp. We’ve also got reader photos, big-game tag deadlines for over a half-dozen Western states and some incredibly odd factoids about black bears. Those critters are freaks — and not just your run-of-the-mill circus-grade freaks, but F-R-E-A-K-S.
That and more is inside the January issue of Northwest Sportsman, the biggest, baddest, localest fishing and hunting magazine in Washington and Oregon. Pick it up on Auto Trader racks at convenience stores, Walmarts, Fred Meyers and more locations today! Head’s up, the November issue of Northwest Sportsman magazine is out. But if you’re looking for a whole new way to approach steelheading, our new kayak guy, Mark Veary of Hillsboro, Ore., details how it’s done from Tupperware. And from we get the scoop on bobber drifting, the love child of Float Fishing and Drift Fishing, from guide Jim Sehl of Alsea River fame. I’ve got a piece on Cougar-country card crushers — how five Eastern Washington steelheaders filled their punchcards during the 2007-08 season, and who they are (believe it or not, of the 17 anglers who turned in full cards that year, 12 were from the Eastside). And I’ve also got the stats on how many steelheaders recorded everything from 29 fish to goose eggs that same season. With Veteran’s Day around the corner, Cami Bayer details how Project Healing Waters has helped Sgt. Brian Kerrigan, hit by IEDs twice in two weeks, recuperate from his wounds through fly tying and fishing. “Uncle Wes” Malmberg reveals WDFW’s proposal to jigger South Sound trout limits — and put in much bigger rainbows afterwards. Class is in session as Prof. Tony Floor teaches North Sound Blackmouth 101, fly guy Chester Allen tells why the Yakima sparkles with rainbows on drizzly fall days, Buzz Ramsey tells how his approach to steelheading has expanded over the years, and Dave Workman switches to semi-auto for waterfowl. And there’s a bunch more stuff in the 136-page issue, which you can find at convenience stores, Outdoor Emporium, Sportco, Auburn Sports & Marine, Three Rivers Marine, Walmarts and select Fred Meyers! Or, just flip to page 123, sign up for the dagger deal, save yourself 50 percent off the newsstand price and get a free folding fillet knife! 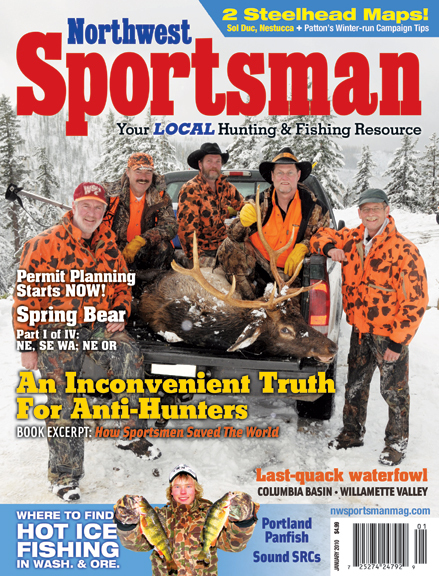 Northwest Sportsman turns 1 year old with publication of our brand-new October issue, another big, meaty 132-pager on all things fish and game in Washington and Oregon. Indeed, this issue is over twice as big as our premiere issue last fall, thanks to the heroic efforts of my fine stable of local writers as well as the ad guys. Among the big, meaty articles are pieces on the record run of wild coho expected back to Oregon’s Siltcoos and Takhenitch lakes. Larry Ellis gets the scoop on why these stillwaters are so productive for coho, as well as how to fish ’em when the silvers come in through fall. The news is also good on Washington’s North Coast and Grays Harbor basin, where a pretty good run of coho is expected back. Andrew Moravec has details five of the best fisheries around Forks, aka Vampireville, plus the Hump. Elsewhere on the Oregon coast, if it’s October, it’s Tillamook time. Andy Schneider teams up with guide Pat Abel for a detailed look at how to fish for the bay’s big, big Chinook (here’s a hint, with big, big herring). We also cover the Rogue Bay and Port Orford big-king fisheries. Then there’s that massive steelhead run flooding up the Columbia. Rob Phillips maps out how to whack and stack ’em as they stack up at McNary Dam on the state line. And I interview my “Main” man for the Snake, Spokane angler Jeff Main who’s got it dialed in at Wawawai, Almota and the Clearwater confluence. Back towards Portland, the coho action continues late into fall, reveals Terry Otto, in his Stumptown column. And you’d be silly to overlook the smallmouth bite on the Willamette. And closer to Pugetropolis, I’ve got the scoop on Lake Washington yellowbellies from Northwest Sportsman’s very own Capt. Perch, Brian Lull, and Tim Bush’s Sounder column is the craziest freakin’ thing ever — tips for Puget Sound salmon from an East Coast surf-fishing sharpie who also uses bass tactics for alpine lakes trout. It spun my head too when I got the piece — but it’s pretty interesting too. For you hunters, we’ve got a big glorious two-page photo spread on Rick Hayes’ bucks. He’s probably the guy on your cell phone with a pair locked-up blacktails. He came across them near his Shelton, Wash., home in fall 2007, and just recently got the duo back from his taxidermist (and a $2,000 bill). They look pretty dang cool. We preview pheasant and quail seasons in Eastern and South-central Washington (a mix of good and really good news) and Eastern Oregon (improving) and go around the Northwest for October’s best rifle buck hunts — all of Western Oregon and in Washington, the Northeast and Southeast corners, Okanogan, South Sound and Columbia Basin. I’ve got details on a massive Eastern Washington mule deer study, a Capitol Forest blacktail study, and have drummed up stories on 10 of the weirdest, most foot-loose big-game critters in the Northwest. My, how those Oregon mountain goats do love to travel! We’ve brought a new columnist on board, fly guy Chester Allen. He’s all about Crooked River trout this issue. And just when you think you know what Buzz Ramsey’s gonna write about, he throws you a curve. Plus we’ve got the famed dagger deal going on — we throw in a $40-50 lockback fillet knife for FREE when you buy a two-year sub for around $30. Thanks for taking a look, we certainly do appreciate it! No, no, no, that’s all wrong, I thought when I walked by it this morning. The pinks will be leaping and splashing everywhere from Sequim to Seattle much earlier than that – more like mid-August. But, yeah, mid-September will be pretty good up in the rivers too. Then I realized the sign was not advertising this year’s run of those humpbacked darlings of Puget Sound, rather the singer of the same name. Hmmm, that’s right, I thought, there is that whole parallel universe outside of Northwest fishing and hunting. But pinks actually are rock stars here in Puget Sound. Indeed, this year’s run is forecast to be the largest since the Beattles cast a line into Seattle’s Elliott Bay. Now, if you’re a Western Washingtonian who’s been here since at least summer 2007, you are most likely intimately familiar with this smallest member of Pacific salmon that returns in truly prodigious numbers in odd years. But if you’re an Oregonian or a Northwest newbie, a wee bit of explanation may be in order. Professor Humpy, give the folks a little Pinkology 101. First of all, those giant humps on males’ backs are not a result of our fantastic efforts at fouling the holy hell out of Puget Sound and environs. No need to roar back down I-5 screaming about the mutant fish we grow up here, that big ol’ bump evolved naturally well before PCBs came on the scene. Secondly, no fish species makes it easier to remember what color lures you should buy. While you may not be comfortable with the color, up here, loggers, machinists and just about everyone else in the know has no problem loading up with enough pink gear to make the queer folk up on Capitol Hill envious. You would look fabulous with some too, sailor. And thirdly, think dill. With this year’s bumper run, urban farmer that I am, I’m growing a bumper crop of the stuff. It goes great with the fish’s delicate, light pink meat. For more lessons in all things pink, please see pages 79-84 and 116-117 of our August issue. Also inside our fourth-straight 132-page issue in a row, big pieces on how to hunt Northeast Washington’s unusual elk herd as well as Eastern Washington bear. South of the Columbia, we preview Cascades deer and elk, as well as Southwest Oregon bear hunts. With a bounty of salmon headed for Buoy 10, we put together a big package on how to waylay some of the 700,000 coho and 500,000 Chinook expected back to the mouth of the Columbia. And while we sing the praises of five postindustrial fisheries in the lowlands of Puget Sound and the Willamette Valley, we also head into the mountains and reveal a rainbow trout fishery deep in the wilds of the North Cascades! You’ll find us at convenience stores throughout Washington, Oregon and northern Idaho, Wal-Marts and Fred Meyers in the Evergreen and Beaver states as well as Schucks, Auto Zones and select bookstores! Greetings from the Coast, Northwest sportsmen! Whether you’re after coho, crabs, clams, lings, surf perch or rockfish, we have you covered in our June issue! If you’re, err, a bit of a spendthrift, we URGE you to pick up this issue because there’s a GREAT value inside: 4 plans for making a max haul on Free Fishing Weekend June 6-7 on the Oregon Coast. We also detail four great destinations in the Inland Northwest — Brownlee Reservoir crappie, Lake Roosevelt walleye, Curlew Lake trout and Odell Lake Mackinaw. Closer to the Northwest’s major hubs, we plan your Puget Sound salmon season, and Terry Otto details the summer runs heading through Portland. And there’s just a TON of other stuff inside the June issue (which, we would LOVE to point out to potential advertisers, has already sold out at one NW tackle shop — and it’s ONLY June 3), everything from tiger muskies to smallmouth bass to kokanee to herring to cutthroat to … oh, jeez, we’re going to run out of room here. 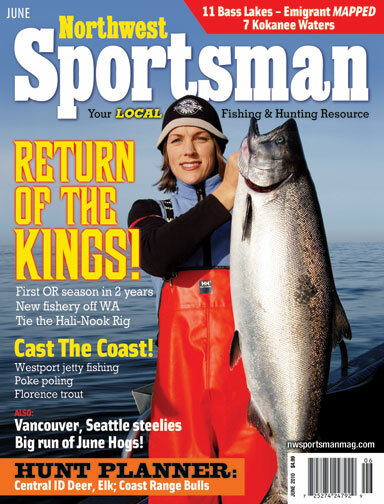 Pick up a copy of Northwest Sportsman today — We’re at Wal-Mart locations around the Northwest, thousands of convenience store racks as well as Sportco, Outdoor Emporium and Auburn Sports & Marine in the Seattle area (but not Three Rivers Marine, where we’re sold out already!). The map of Lake Tapps in our May issue may look like an MRI. That’s what coworkers of Todd Rock at Auburn Sports & Marine told him when we faxed it over. 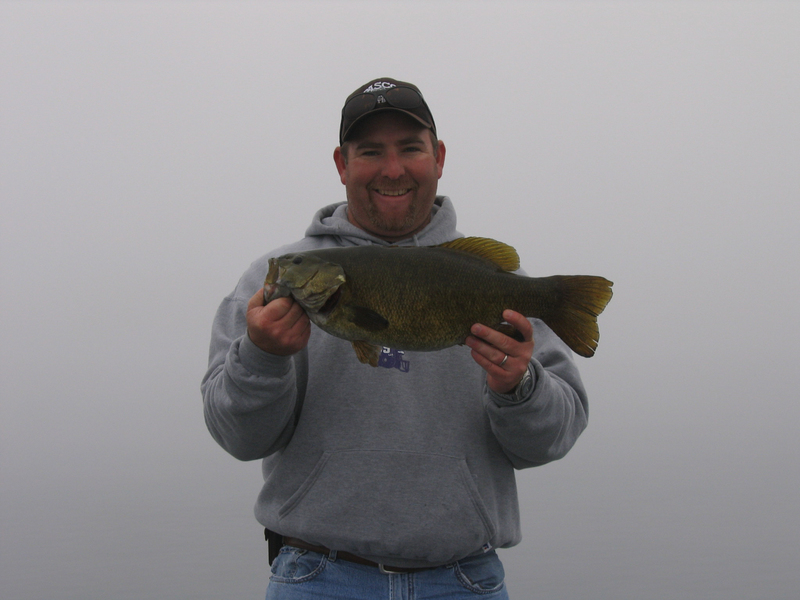 And in a sense it is because we picked the brains of Rock as well as another local basser, David Rash, on how to fish the Western Washington smallmouth lake. But we also got inside the head of Oregon bass pro David Swendseid for how to fish Hagg Lake outside Portland; it’s mapped as well. And we mapped the best spots on Washington and Oregon’s coasts for surfperch. Our May issue also looks at roadtripping Alaska’s Kenai, sets you up for “second season” springers in the Inland Northwest and shoves you offshore for halibut and lingcod. Dig in! The issue’s on newsstands right now! You are currently browsing the archives for the Current Issue – Features category.